On November 26th 1901, Alois Alzheimer met his now famous patient, Auguste D., for the first time. At the time, he was an assistant physician at the psychiatric institution in Frankfurt. Soon into their first conversation he realized that the 51 year old woman showed symptoms unlike any he had ever seen before. When Alzheimer asked her questions, her replies didn’t match. She also often stopped mid-sentence as if she had forgotten what she was going to say. Her memory increasingly failed her, she was confused and anxious. Alzheimer was intrigued by these symptoms and conducted more interviews with her. But it was not until nearly five years later that he got a first glimpse into the pathology underlying these strange symptoms. Drawings by Alois Alzheimer showing the pathological changes in the brain of one of his patients. On April 8th 1906 Auguste D. died. Alzheimer, then head of the anatomy laboratory at the Royal Psychiatric Clinic in Munich, received her brain for histological analysis. Already from his first analyses he realized that also anatomically this case differs from all brain pathologies known at the time. Throughout the brain cells had died on an immense scale. In the neurons that remained Alzheimer noticed thick, strongly staining fibrils. Moreover, the cortex was full of plaques of unknown composition. 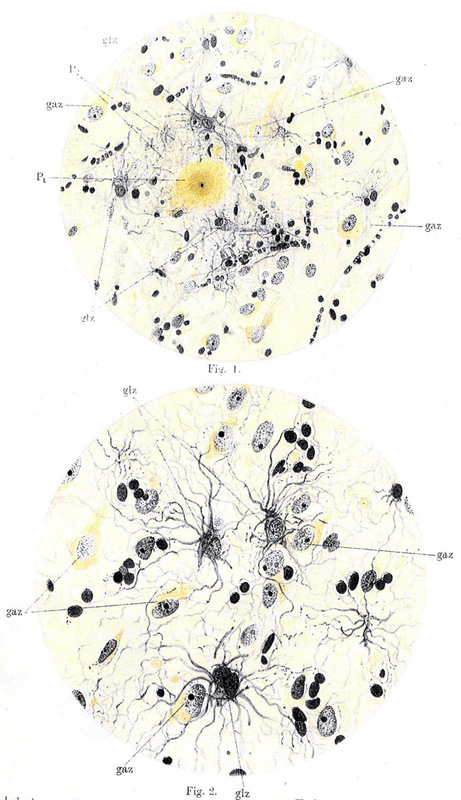 Auguste D’s brain thus showed the histological features that are today associated with Alzheimer’s disease: the massive loss of neurons and the presence of amyloid plaques and neurofibrillary tangles. On November 3rd 1906 Alzheimer first reported his findings at a meeting of psychiatrists in Tübingen and proposed that he had discovered a new disease. The reaction of the audience, however, was very muted. No one asked any questions. But Alzheimer remained captivated by the disease and studied more cases. In 1911, he published his findings on the histopathology of Auguste D.’s brain together with another case. This paper marked the beginning of a huge body of publications into one of the most important diseases of our time. Dahm, R: Alzheimer’s pathology, circa 1906. The Scientist (2009), Vol. 23, Issue 3, p. 84. Dahm R (2006): Alzheimer’s Discovery. Current Biology, Vol. 16(21), p. R906-910.